Creation of mobile and web business apps by citizen developers using rapid mobile app development products is exploding. Forrester Research projects the market for such citizen developer rapid mobile app development tools (a.k.a., mobile no code/low-code platforms) to be some $3 billion by 2020. Similarly, Gartner predicts that by 2018, more than half of all business apps will be created by citizen developers using rapid mobile app development tools. empower citizen developers to craft mobile and web apps, while still giving seasoned developers a coding-optional environment to meet enterprise requirements (such as security, data integration, etc. ), when needed. meet user needs by always working offline. can easily integrate with corporate data sources, common enterprise databases, SaaS applications and REST services. I recently wrote about the enterprise trend to empower citizen developers with rapid mobile app development platforms in the DZone article, "Are Citizen Developers the Future of Mobile?" and in the Alpha Software white paper, "The Democratization of Mobile and Web App Development." 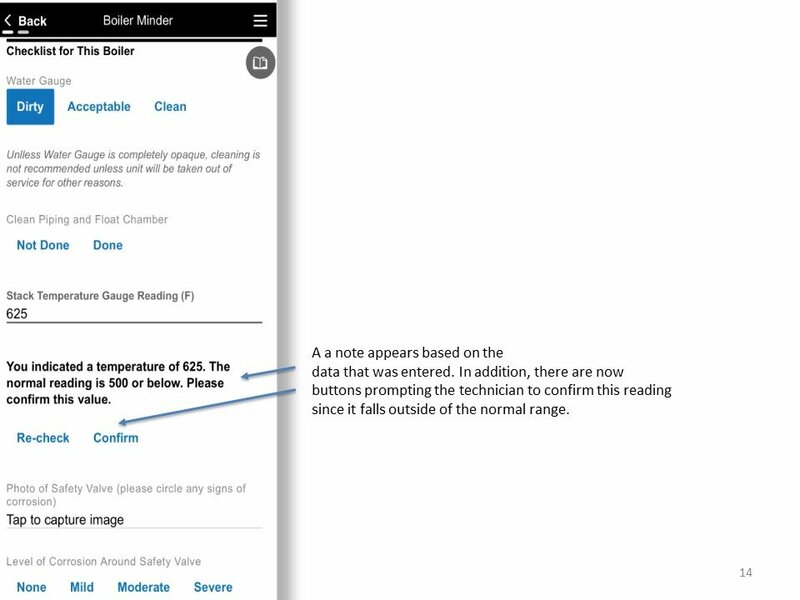 Oxford Instruments tasked Superconducting Technology Business Analyst Sagrika Mehta with developing a solution that would let the company’s semiconductor shop floor workers reliably manage preventive action efforts in the manufacturing process directly from their tablets. Using the Alpha Anywhere rapid application development platform, she was able to prototype three mission-critical forms in just 2 days. Only 30 days later Mehta had built, tested and deployed the full preventative action app, beating the business deadline. The RMAD app is now helping workers to identify and correct manufacturing issues faster than ever before. DAIKIN/Goodman Territory Sales Manager Daniel Santucci needed to help contractors selling the company's heating, ventilation and air conditioning products, while better tracking leads and sales. Using the Alpha Anywhere rapid app development platform, Santucci was able to build a mobile app in a month's time to help his contractors better track and fulfill sales. He also built a web app so Goodman executives could tap into enterprise sales information. Goodman provides the mobile app for free to its partner contractors in the field who fix or install HVAC systems. The app helped Goodman generate and retain business tenfold, because it provided independent contractors with a free solution that helps them grow and manage their own businesses. Santucci was promoted to Division Pricing Director, in part due to his success mobilizing the sales organization. 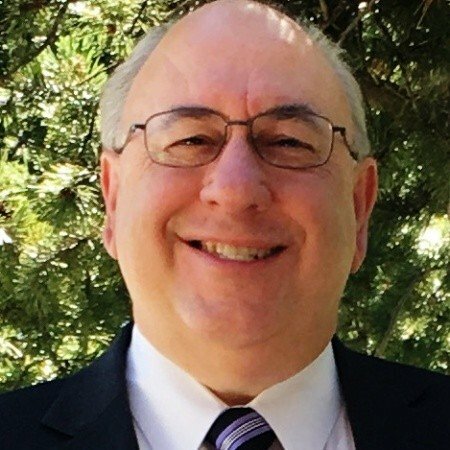 Fast Mirror founder John Azzara Azzara wanted to use his extensive leadership experience in human resources to build a self-service Software as a Service (Saas) solution that would help human resources organizations address some of the challenges they are currently facing with performance feedback and professional development. He built the Fast Mirror subscription-based service by himself, including the SaaS framework and the capability to utilize API's of existing platforms to integrate information into his SaaS solution. He finished the work in half the time a competing product would have taken. These citizen developers were able to build sophisticated mobile and web apps without hiring outside mobile app developers. Because of the richness of the rapid mobile app development product they selected, they were able to leverage built-in security, data integration and offline capabilities, along with rich user experiences. We’re very pleased that report co-author Jason Wong will be attending this year’s Alpha DevCon in Danvers, MA. For more information on Alpha DevCon 2016, click here. 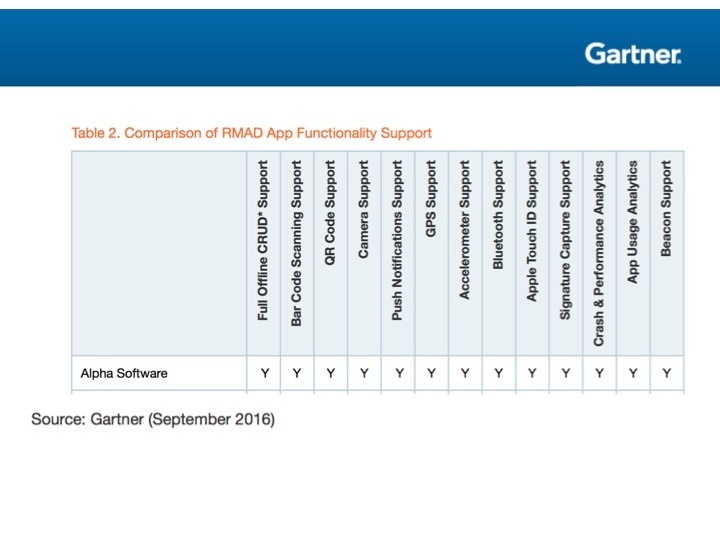 To read the full Gartner Market Guide to Rapid Mobile App Development (published in 2016), click here. To compare how Gartner viewed the Rapid Mobile App Development market as it initially emerged and what's changed since then, click here. To learn more about what Rapid Mobile App Development without limits can deliver to your team, click here. Read Mobile Advertising Watch's recent story: "Alpha Software Delivers Offline Capable Rapid Mobile App Development and Deployment with No Limits to the Enterprise.